"SANTA FE" - 2 Pins - High Shackle. Made for: Atchison Topeka & Santa Fe. (171.5). 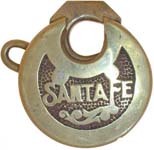 "SANTA FE" - 2 Pins - High Shackle - "A T & S F RR". "A T & S F RR" is stamped on the obverse of the shackle. Made for: Atchison Topeka & Santa Fe. (171.7). "SANTA FE" - 2 Pins - High Shackle - "ICE HOUSE". "ICE HOUSE" is stamped on the obverse of the shackle. Made for: Atchison Topeka & Santa Fe. (171.8). "SCHENECTADY LOCOMOTIVE WORKS." - No Pins. Made for: Schenectady Locomotive Works. Mfg by: Miller Lock Co. (173.0). "SCHENECTADY LOCOMOTIVE WORKS." - No Pins - High Shackle - Narrow Letters. 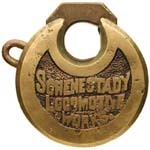 Made for: Schenectady Locomotive Works. Mfg by: Miller Lock Co. (173.1). "SEABOARD" - Left Pin - Narrow Letters. Made for: Seaboard. Mfg by: Miller Lock Co. (174.0.1). 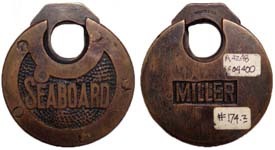 "SEABOARD" - Left Pin - Narrow Letters - "MILLER". Made for: Seaboard. Mfg by: Miller Lock Co. (174.0.2). Seagate - Left Pin. (Chinese lettering). Mfg by: Miller Lock Co. Made for: Chinese Coast Guard. (174.3). "SECURE 6 LEVER" - No Pins. (175.0). 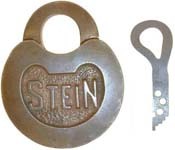 "SECURITY 6-LEVER" - No Pins - High Shackle - Narrow Letters. Probably a German company manufactured this padlock. (176.0). "SHOEMAKER BRIDGE Co˙" - Left Pin. "MADE FOR" is stamped on the obverse of the case at 12 o'clock. (177.2). "S.L. Co." - 2 Pins. Mfg by: Miller Lock Co. (178.9). 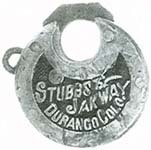 "STUBBS & JAKWAY DURANGO COLO." - No Pins. A Lumber company. Mfg by: Miller Lock Co. (179.8).